Send text from computer software presents an exclusive technique to create and send cellular phone text messages from Laptop/Desktop to numerous cell phone numbers over worldwide phone services. Bulk sms sender application propels phone messages through PC by involving Windows based cell phone or GSM mobiles. Send text from computer contains astonishing graphical user interface from those client can admittance program frankly without any technological training requisite. SMS sender software sustains all key Windows based mobile phones similar to Motorola, i-mate, Samsung, Nokia, Toshiba, HTC Touch, E-ten, T-mobile, HP iPAQ and more to convey text mobile messages from computer to multiple phone numbers at a same time. Send text from computer software are more admired among event alert, business advertisement, seasonal greetings, product promotions, promotional campaigns, invitations, job notifications and etc. 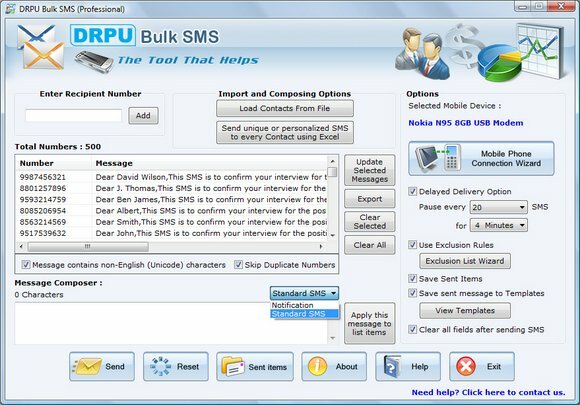 SMS creator application organizes all sent mobile messages and cell phone numbers in Text file or Excel file system on PC for additional exploit. Bulk sms software offers preeminent communication environment among relative, friends, manager, client, employee, family, company, students and more. Software allows downloading trial version to discern advanced software elements and operational capabilities without any added charges. Application maintains all main Windows operating systems akin to Windows 7, Windows Vista, Windows Server 2008/2003, Windows XP etc. * Send text from computer software provides facility to create and deliver phone group sms via computer to various cell phone numbers. * Application supports all Windows based mobile phones like LG, Nokia, Samsung, Motorola and etc. * Software has amazing graphical user interface which helps novice user. * SMS sender software delivers mass cell phone sms on universal mobile networks. Softros LAN Messenger - Softros LAN Messenger is an instant LAN messaging software for home or office users. It does not require a server and is very easy to install and use. Works on the TCP/IP based networks and supports Windows/Citrix terminal services. 1st Fax Extractor - The 1st Fax Extractor (FE) is a professional targeted fax number and phone number extractor tool. With 1st FE , you can easily and quickly set up your own business fax number and phone number lists. ARoglyph for Android - Place marks with text notes, voice comments or pictures on the new layer of reality with this Augmented Reality Android app. Those marks can be seen by any or only chosen people, and those people can read, listen, comment and share marks. ARoglyph for iOS - Place marks with text notes, voice comments or pictures on the new layer of reality with this mobile Augmented Reality iOS app. Those marks can be seen by any or only chosen people, and those people can read, listen, comment and share marks. Bulk SMS Caster Professional - Bulk SMS Caster Professional is a reliable Bulk SMS Software developed to assist in sending Bulk SMSs through PC or Laptop. The software can handle 4 mobiles simultaneously. Personalized message option and Delayed delivery option are provided. ECTkeyboard - ECTkeyboard is a program that allows individuals with significantly reduced muscular activity (ex paralysis sufferers, quadriplegic patients) to type messages and even lengthy texts letter-by-letter via pressing only one physical button.